While wearing your 40 deniers with a pair of sandals has become de rigueur, the thought of black tights and white sneakers often horrifies the fashion world. Why is that? Well, although white trainers have definitely become one of the most popular flat shoes of choice, when it comes to black tights, the jury is still out. But we're here to tell you that this combo should no longer be ignored. In fact, it should be embraced. Plenty of street style stars have worn this look, and have given it their own twists. It's not only the minimalist's best bet for comfort and style, but it's also great for when you're running around doing errands. If we still haven't persuaded you, perhaps the next five images will, so keep scrolling to see how to style yours, and then shop our favourite sneakers right now. Style Notes: Add a pink coat to the combo, and it won't feel so monochrome. Style Notes: Make sure you have clashing prints to liven up your outfit but also ensure there's a dash of black and white to pull the whole ensemble together. Style Notes: For super-cold weather, this combo couldn't be better. Add an extra coat over a black blazer, and then just make sure you have a stylish bag to ensure you've got a bit of fun going on. Style Notes: The queen of wearing sneakers, Veronika Heilbrunner, proves that a cute short dress is all you need to make black tights and white sneakers look ace. Style Notes: Can't face those 40 deniers? Fear not. Opt for a pair of sassy fishnets instead. Emma Watson's trainer of choice, FYI. 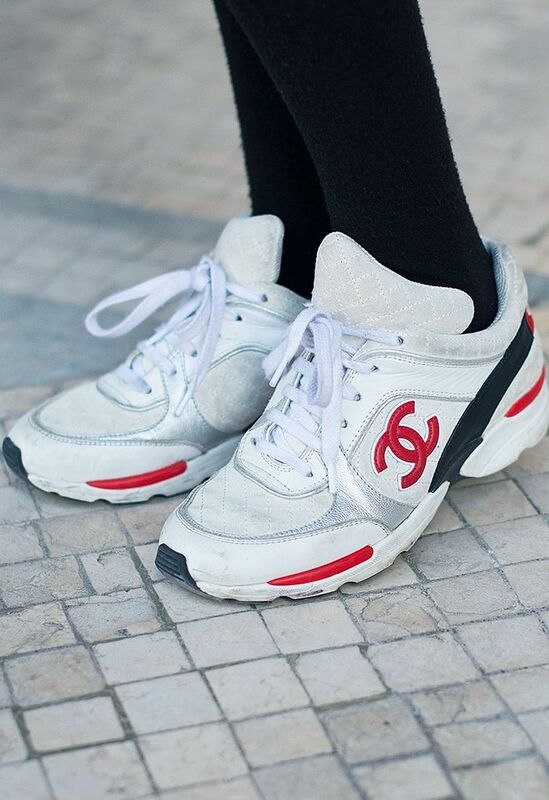 We're so into these vintage-style sneakers. You can't go wrong with a classic pair from Nike. Into the whole "dad" trainers? These are for you. Ganni proves once again that it can do no wrong. Next up, 42 of the best party dresses that are guaranteed showstoppers.